NorthEast United FC’s Seiminlen Doungel became the first Indian player to score a hat-trick in this edition of the Indian Super League as NorthEast United FC tore visitor Chennaiyin FC’s defence to shreds with a 3-1 victory at the Indira Gandhi Athletic Stadium, Guwahati, on Friday, The Hindustan Times reported. 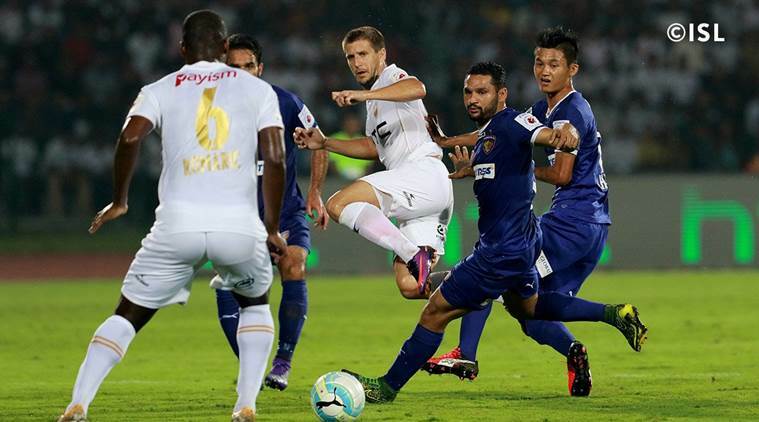 NorthEast United had lost 0-3 against Chennaiyin FC in Chennai earlier in their first-leg clash. There is a huge gap between the two teams on the ISL table with Chennaiyin targeting a top spot and NorthEast trying to rescue their campaign. It seemed a mismatch but Doungel turned the tables on their rivals with a hat-trick, the first ever for NorthEast United since inception in 2014.